With its high fiber and omega-3 fatty acid contents, ground flaxseed is a nutritious addition to your diet that can improve your digestive health, lower your cholesterol levels and reduce your risk for heart disease. Your body can't absorb the nutrients in whole flaxseed, which is why it's important to grind the seeds before eating them. Once that's done, you can add them to a wide range of foods and recipes to boost their nutrient content and improve your health. Stir ground flaxseed into a hot bowl of oatmeal for a satisfying, fiber-rich breakfast. Two tablespoons of ground flaxseed will add nearly 4 grams of fiber to your meal. Add ground flaxseeds to baked goods to improve their nutrition without adding too many extra calories. Ground flaxseeds only contribute 37 calories per tablespoon. Mix them into cookie batter, bread dough or even pizza dough as an easy way to boost your intake. Prepare the flaxseeds as an egg substitute for baking. Emma Christensen of The Kitchn website says the flaxseeds should be ground into a fine powder. Then, combine 1 tablespoon of the ground flaxseeds with 3 tablespoons of water for every egg you want to replace in your recipe. Whisk the mixture until it becomes gelatinous and then add it to your recipe as you would eggs. Blend ground flaxseeds into a cup of yogurt or a smoothie to increase your omega-3 fatty acid content. 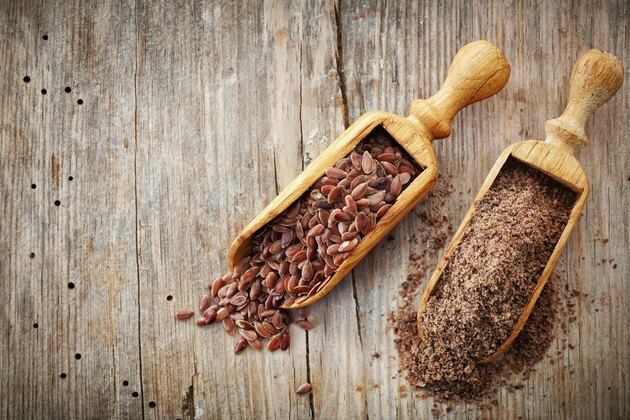 One tablespoon of ground flaxseed offers 1.6 grams of alpha-linolenic acid, the type of omega-3 fatty acid found in plant foods. That's at least 100 percent of the amount recommended for adults each day, according to the Linus Pauling Institute. Coat chicken breast in ground flaxseed before baking, suggests food and travel writer and photographer Katherine Martinelli. Dip the chicken in egg, dip it in a mixture of ground flaxseeds and whole-wheat breadcrumbs, then pop it in the oven for a healthy dinner. Martinelli remarks that she finds she eats less when she adds flaxseeds to recipes because they're so filling. Flaxseeds are also a good source of protein, with almost 3 grams per 2-tablespoon serving. That's a little less than 7 percent of the 46 grams of protein women need each day and a little more than 5 percent of the 56 grams men need each day, according to the Institute of Medicine. The Vegetarian Resource Group: Whole or Ground Flax Seed? The Kitchn: Egg Substitutes in Baking? Try Flax Seed!